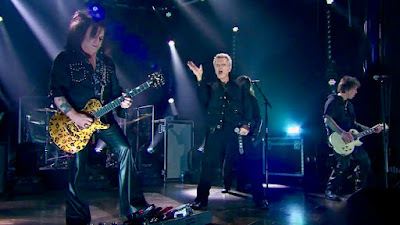 Billy Idol performed his 1982 classic, “White Wedding (Part 1)”, on CBS-TV’s The Late Late Show with James Corden on August 17 and video from the program is streaming online. The second single from Idol’s self-titled 1982 album debut reached No. 36 on the US Billboard Hot 100 while the project peaked at No. 45 on the Billboard 200 on its way to gold status for sales of 500,000 copies. Idol’s late night television appearance was to promote the final shows of his two-year residency at the House Of Blues Las Vegas at Mandalay Bay Resort and Casino this October. “Billy Idol: Forever!” sees the rocker deliver tunes from throughout his career, including tracks from seminal British punk band Generation X and his solo hits. Ahead of the final Las Vegas run, Idol will join The Who’s Pete Townshend for a short US run of his Classic Quadrophenia stage show next month. Alongside Alfie Boe and a full symphony and chorus, the shows present the new orchestral version of the band’s 1973 concept album based around lead character Jimmy’s search for an identity amongst the mods and rockers in mid-60s Brighton. In addition to stops in Lenox, MA, New York and Los Angeles, Pearl Jam’s Eddie Vedder will join the lineup for a September 13 date in Chicago, IL.